Freezer drying is used mostly to dry out paper items such as books, photos, and documents. Since this is a passive drying method it might take several weeks to many months for the damaged paper to completely dry. Drying time depends mainly on the temperature in the freezer, the extent of the damage, and how spread out are the papers in the freezer. 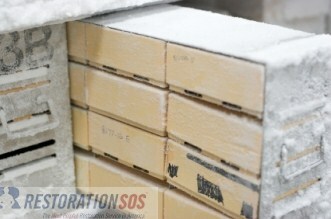 The temperature in the freezer must be maintained no warmer than -10 degrees F, and as always, paper should be placed in the freezer as soon as possible after becoming wet. It is also recommended to place the paper in a zip bag before putting it in the freezer. Since water vaporizes without becoming liquid again there is no additional wetting, swelling, or deterioration. Ink will not smudge and the book has better chances of survival. In fact, vacuum freeze drying results are often satisfactory because no rebinding is necessary, and mud, dirt and soot are vacuumed to the surface, allowing a faster cleanup. Although some rare or unique materials can be dried successfully by vacuum freeze drying, this process is not recommended for leather and vellum items. The main disadvantage of vacuum freeze drying is the price because of the equipment required. If required for a limited number of books, the per-book cost can be relatively high. When paper is slightly-to-extensively wet, it may be dried using vacuum thermal drying. Books and records are placed in a vacuum thermal-drying chamber when they are wet or frozen. The materials will dry as vacuum conditions start and heat is pumped into the chamber. Because materials stay wet, not frozen, while they dry, this process usually leads to distortion in books, and causes adhesion of coated paper and photographic materials. Water-soluble inks or pigments will also be affected. This method is more recommended for small amounts of records, unbound materials, and documents which have suffered extensive water damaged. This method utilizes low-temperature freezers and an advanced variation of freezer drying in a more active approach. If performed correctly, Thermaline drying will never distort materials as a result of the process. This method is the most expensive due to the individual handling provided for every item. Thermaline is intended primarily for rare book and manuscript collections.